3 Views On A Tragedy: Reporters Recall First Days After Katrina When Hurricane Katrina made landfall on the Gulf Coast, devastating regions of Louisiana and Mississippi, three of NPR's correspondents saw the storm firsthand. These are their stories. 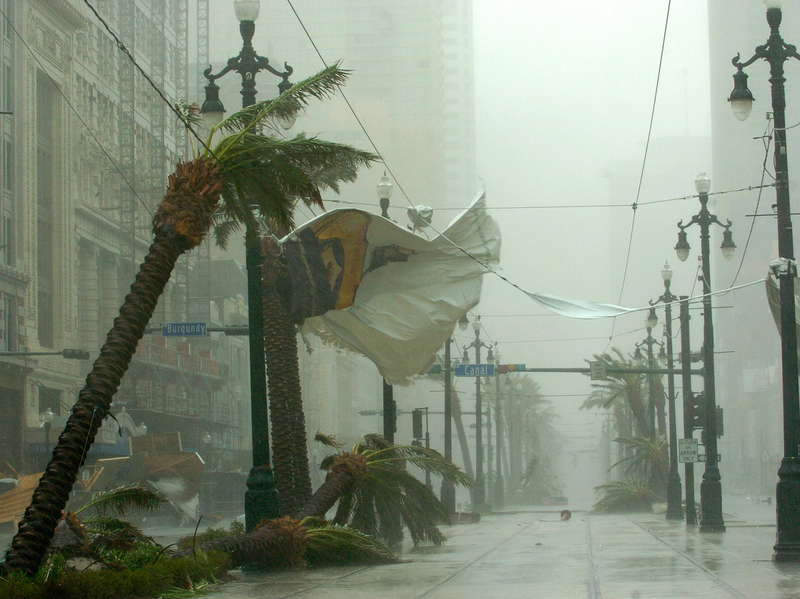 Palm trees bend and banners rip on Canal Street as Hurricane Katrina blows through New Orleans on Aug. 29, 2005 — 10 years ago Saturday. On the morning of Aug. 28, 2005, the National Weather Service issued an urgent weather alert. "Devastating damage expected," the message read. "Most of the area will be uninhabitable for weeks ... Perhaps longer." A day later, on the morning of Aug. 29 — 10 years ago Saturday — Hurricane Katrina slammed into the Gulf Coast. By that afternoon, the storm had slowly moved on. It appeared that the worst was over. "The city officials were glibly saying, 'Looks like we dodged the bullet,' " recalls NPR's John Burnett. "And in fact, the bullet hit us in a bull's-eye." Burnett and NPR's Greg Allen were hunkered down in hotels in New Orleans at the time. Burnett remembers when they first realized that the disaster was just beginning. "The water was creeping up through the city, covering 80 percent of it," Burnett says. "And all of a sudden, all of the plans, and the investigative reports, and all of the modeling that the city had feared, was coming to pass. This was the big one, and it was almost too mammoth to comprehend." The hurricane decimated other parts of the Gulf Coast, too. Mississippi suffered some of the heaviest damage from the storm. Former NPR correspondent Kathy Lohr saw the devastation in the state firsthand. Reporting from some of the hardest-hit areas, in Gulfport and Biloxi, she saw wreckage ripped from the water and splayed across roadways. Those stark images still stay with her, she says. The rest of the country needed to see and hear what was happening to this great Southern city. They needed to see that the reassuring pronouncements from federal officials meant absolutely nothing. "Floating barges that had been casinos in the Biloxi-Gulfport area were picked up and slammed down onto the shore. The three-story Copa Casino [barge], which was a pastel pink, ended up in the middle of Highway 90," Lohr says. "And it's just such a shock to see." Hurricane Katrina ultimately became one of the most costly and destructive disasters in U.S. history. Some 1,800 people died; 1.5 million were forced to leave their homes. In property damage alone, costs amounted to $108 billion — as expensive as the entire Apollo moon-landing project. Burnett, Allen and Lohr reported from the ground in the midst of the storm and its aftermath. Below — and at the audio link above — they share their memories of the devastation. The indelible memory I have of covering the aftermath of Hurricane Katrina in New Orleans was how quickly and completely a modern, powered, connected, policed, orderly American city can descend into utter chaos. There was no 911 service; streets were impassable. No emergency rooms, no electricity, no stores, no communication system. The city had become pre-industrial, medieval. And no one was coming. No one was in charge. No one knew what to do. Once people were rescued from rooftops and deposited on dry land, they were left completely on their own. Reporters became, in some cases, first responders. We were the first individuals that some evacuees encountered when they trudged out of their underwater neighborhoods. They wanted food, water, diapers, medicine — they didn't want an interview. All we could do was get their stories. I recall an overwhelming sense of powerlessness that we could not do more to help people, instead of just making deadline. John Burnett, standing in knee-deep water in front of the Superdome shortly after Hurricane Katrina had passed. Of course we had a job to do, because the rest of the country needed to see and hear what was happening to this great Southern city. They needed to see that the reassuring pronouncements from federal officials meant absolutely nothing. New Orleans had dissolved into bedlam and the scale of the disaster had overwhelmed every local, state and federal emergency response plan formulated to handle a major hurricane. The storm didn't just strip the city of law and order and utility services. It stripped people down and revealed who they were. How would you react? Some police stayed on the job heroically. Others abandoned the city. Still others joined the looters. Some flood victims preyed on one another. But most of the victims of Katrina helped one another. I watched people at the Morial Convention Center sharing water, sandwiches, and clean clothes lifted from the mall next door. What I will never forget is the sense of despair in the voices of evacuees waiting in the squalid convention center, day after day, for aid and buses that never came. "You know, everybody there just felt like trash," remembered Kevin Goodman, a Mardi Gras Indian chief from the 7th Ward. "It was like we was left for dead." 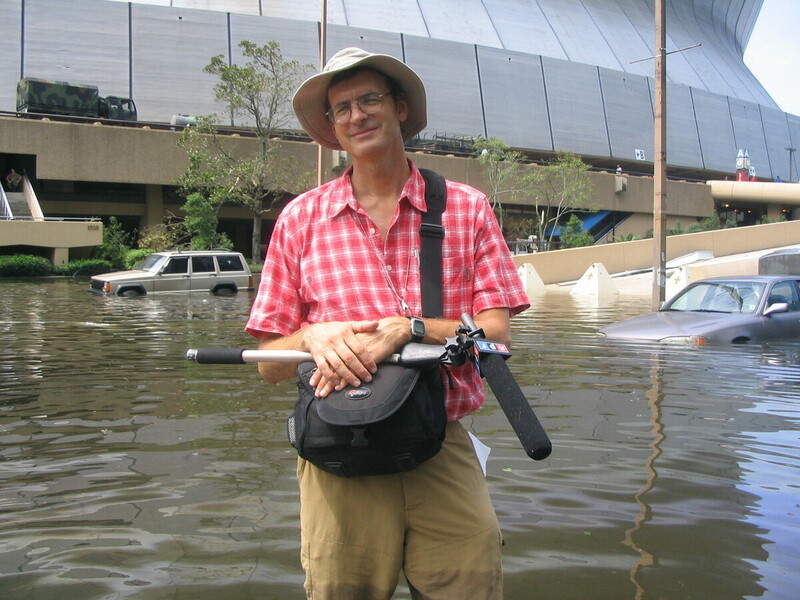 When I arrived in New Orleans with other members of the NPR team, the day before Katrina, we knew the hurricane would be a bad one. We were all familiar with studies and reports that described a scenario very similar to the one that played out. What I hadn't expected was the lawless atmosphere and slow government response after the storm. I saw the first signs of looting while Katrina was coming ashore. During a lull, when I ventured out, I saw a department store window shattered and goods strewn on the street. Walking into the French Quarter, I got another surprise. When I approached two people with a question, one pulled a gun and warned me away. The day after Katrina was sunny, and at first it seemed as if New Orleans had avoided the flooding many had predicted. We'd heard reports of levee breaches and producer Muthoni Muturi and I soon saw the flooding firsthand. We went to the B.W. Cooper homes, a public housing complex. Many first-floor units were already flooded. We talked to residents making plans to get out. That's when I saw that our car, which I'd parked on a dry street, was now surrounded by water. 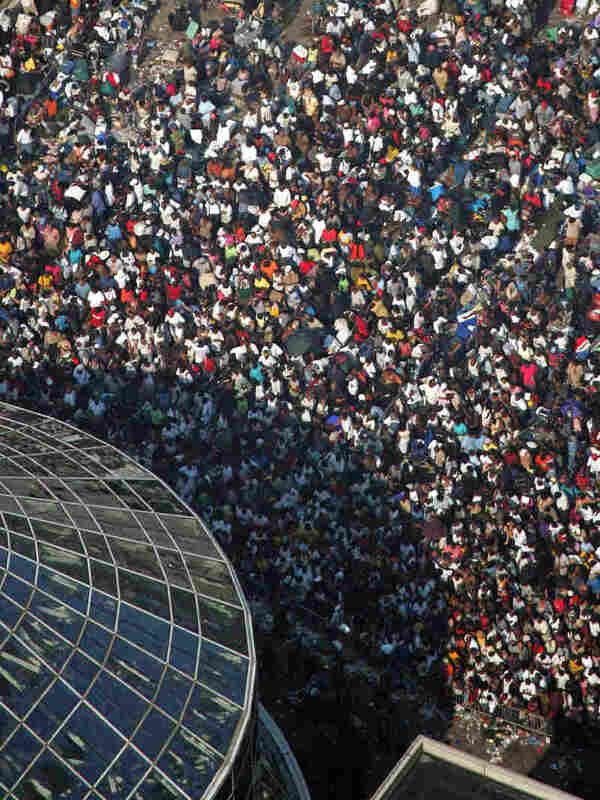 Thousands wait to be evacuated outside the Superdome on Sept. 2, 2005. When people realized the floodwaters were rising, it seemed to raise the level of panic and lawlessness in the city. A few blocks away, we saw our first dead body. Covered with a plastic sheet, we saw a male gunshot victim — lying there, residents said, since the night before. Driving through the city, we saw people lined up outside a chain drug store, filing in through the shattered doors and coming out carrying goods. I quickly found out that being a reporter in that situation can be dicey. I saw a man who, like me, was watching the activity. With microphone in hand, I asked him if he would describe what's going on. He glared at me and said, "No." When I asked why, he said, "Because I'm not a snitch." By the time we got to the city's largest "shelter of last resort," the Louisiana Superdome, it was two days after the storm. Floodwaters surrounded the sports arena. We were able to hitch a ride in on a National Guard high-water truck. The Superdome was truly a miserable place. Inside, with no air conditioning or ventilation, it was stifling and the smell was terrible. Outside, people lay on sheets of cardboard on walkways usually populated by sports fans on their way to Saints games. When it was time to leave, we found ourselves wading through waist-deep water. Just as surprising as the lawless atmosphere was the slow government response. Many at the Superdome had been waiting for days on buses they'd been promised would take them to shelters in Baton Rouge and other cities. Four days after the storm, I was aboard the Algiers ferry, which was picking up people from the flooded communities of Arabi and Chalmette. Many said they'd been waiting for help since the storm. I've been back to New Orleans many times since then and reported on the city's progress. The mountains of debris eventually disappeared; many neighborhoods were rebuilt. Some business districts, such as those in Central City and the Freret neighborhood, are more vital than before the storm. Ten years out, you see few of the telltale marks of Katrina anymore — the discolored flood lines and spray-painted X's left by rescue teams that searched houses after the storm. Some neighborhoods may not be fully repopulated for decades. In the Lower 9th Ward, only about a third of the households came back. Some longtime residents told me they feel now they made a mistake returning and rebuilding their homes in the still-desolate neighborhood. New Orleans today has 110,000 fewer people than before Katrina. But something important is happening there. Rebuilding and recovery brought new people, new businesses, even new industries to the city. For years before Katrina, the city's population was steadily shrinking. Now, it's growing. The Kids Quest building sits in the middle of Route 90 next to the Grand Casino in Gulfport, Miss., on the day after the storm. 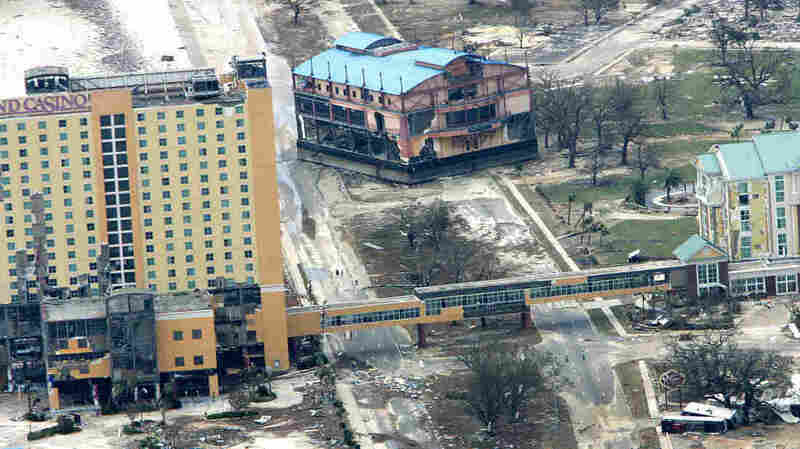 Both buildings were wrecked from the high winds and waves of Hurricane Katrina. Katrina's nearly 30-foot storm surge and the tornadoes that came in with the hurricane flattened or damaged nearly every home, building and business along the Mississippi Gulf Coast. The live oaks that lined this once-picturesque area were cracked open and uprooted. Some said they've been afraid for years. Every time the next named storm is brewing offshore, it sends shivers to this area. And there was so much debris — piles and piles of splintered wood, sagging insulation, shattered glass and the unrecognizable tiny pieces of tens of thousands of lives. Trailers full of raw chicken washed up and were wrenched open in the storm. The meat started rotting almost immediately in the thick August heat. The stench was overwhelming — the rotting chicken, the sour slimy mess of debris that washed ashore, combined with natural gas leaks that smelled like rotten eggs. There was no electricity and no water and almost no way to communicate with people, unless you found them in a shelter or near the remains of their home. Much of the national attention was focused on the levee disaster in New Orleans, but people were facing catastrophic conditions in Mississippi, too. Those who first emerged after the storm were in a deep shock. You could see the disbelief and the worry. Some said they've been afraid for years. Every time the next named storm is brewing offshore, it sends shivers to this area. Some were not able to rebuild their homes for years. Others may never move back. In some neighborhoods, the shells of houses or just the foundations of homes remain. It's the struggle to find a way to rebuild that defines these Mississippi communities. For many, this is not yet a time to celebrate, but rather another milepost along the journey.